The concept of the muse suggests that artistic inspiration is a soaring rendezvous with some sort of personification of perfection. I’d guess that more often art struggles to its feet as a messy, necessary reply to either the grueling sameness of everyday life or to jarring, terrible deviations from that sameness. Somehow, when encountered in cardboard form, Don Mossi embodied both of these crucibles, a man whose haunting mien threw the children who gazed upon it out of the dream of a flawless baseball heaven and back into their imperfect everyday solitudes, where they would be troubled forever after by Mossi, that bringer of the news that life will not be beautiful. The card used to illustrate the passage features Mossi looking particularly sepulchral in a Tigers uniform. Many years later, cartoonist Daniel Clowes recreated the card in his Eightball comic along with a caption that seemed to give voice to the most common reaction of having an image of Mossi in mind. There’s just something about that face. It stays with you. It makes you want to do something. There’s no way around it: it inspires. Mike Shannon, in his book Tales from the Dugout, relates how the image of Don Mossi’s face on a baseball card led to new life and new connections, a cult of Mossi arising around a wild Cincinnati party thrown every year on his birthday and climaxing in a phone call to the man himself. Mossi was a good pitcher, too, which often seems to get overlooked when he’s mentioned (he’s been mentioned before on this very site, in an early post I did on Andy Etchebarren, and I neglected to mention Mossi’s pitching prowess, instead going for the cheap shot of calling him “the Babe Ruth of ugly”). Bill James, always on the money with this sort of thing, does call Mossi “pretty darned good,” but the praise is like a quick glimpse of the back of a card soon forgotten amid all the hours of staring queasily and with strangely tenacious fixation at the front of the card. I for one have been staring at the front of the 1966 Don Mossi card at the top of this page for days, ever since it was very kindly given to me by a fellow baseball card fanatic named Bruce at my book-signing in San Diego this past Saturday. 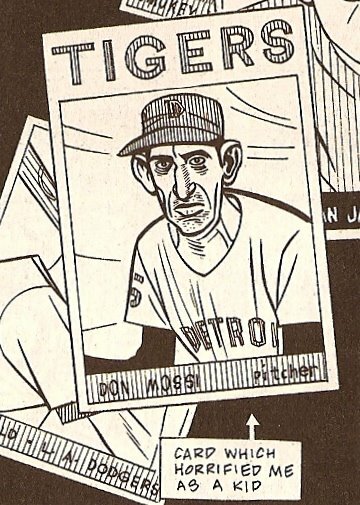 (Bruce does not shy away from the face of Don Mossi but, perhaps like some sort of medieval penitent believing that subjecting oneself to horrors daily might bring one closer to a holy life, has made the collecting of Don Mossi cards the center of his continuing forays into baseball card collecting.) The 1966 card is Mossi’s last, and it is Bruce’s favorite. I can’t remember Bruce’s exact thoughts on why it was his favorite, but I think part of it had to do with him being in baseball nowhere with the Kansas City A’s. He had, in his earlier years, been a member of good and, in 1954, his first year, even great teams, and now here he was, on the brink of oblivion with a team that would soon cease to exist in its current form. The theme of imminent dissolution extends to his features, which all seem to be straining to escape the general parameters of what it means to be a part of a face. Only the context of a baseball card would fix the mass in the background as the blurred image of a stadium; taken on its own, the mass seems much more like a polluted cresting wave. In moments, Don Mossi will be no more, the cubist collage that is his face swept away in a grimy riptide. That’s right. In his own way, and quietly, and long ago, and in lumpy fits and starts, Don Mossi set down an entire nine innings worth of batters in a row. Don Mossi was perfect. 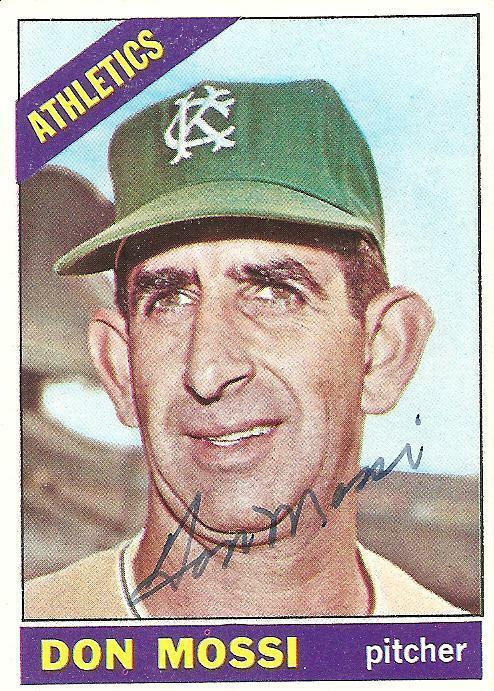 You are currently browsing the archives for the Don Mossi category.